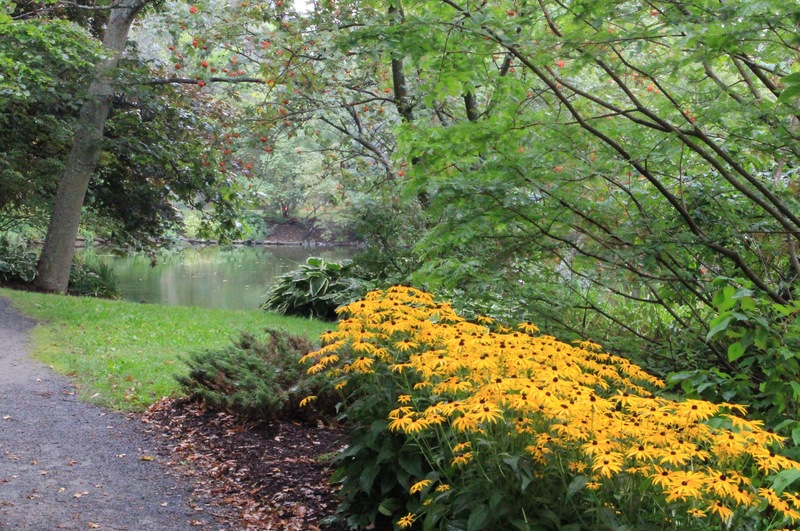 A photo tour of the Halifax Public Gardens. It’s back to reality at an unreal 29 degrees. Labour day has come and gone and the kids are back at school. A month after the weather decided to give us a taste of fall, we are now back in full summer mode, enjoying a balmy 29 degree day (and 20 degree night). If you’re confused… join the crowd. It’s been the driest summer in 10 years (statistics courtesy of halifax.weatherstats.ca). Though menacing clouds threatened most of our days this summer, they didn’t perform as promised. All this, after what was arguably one of the worst winters in memory. It’s a wonder our gardens haven’t decided to call it a day. The Public Gardens are far from calling it a day, thanks to all the watering and tidying the gardeners have been doing. 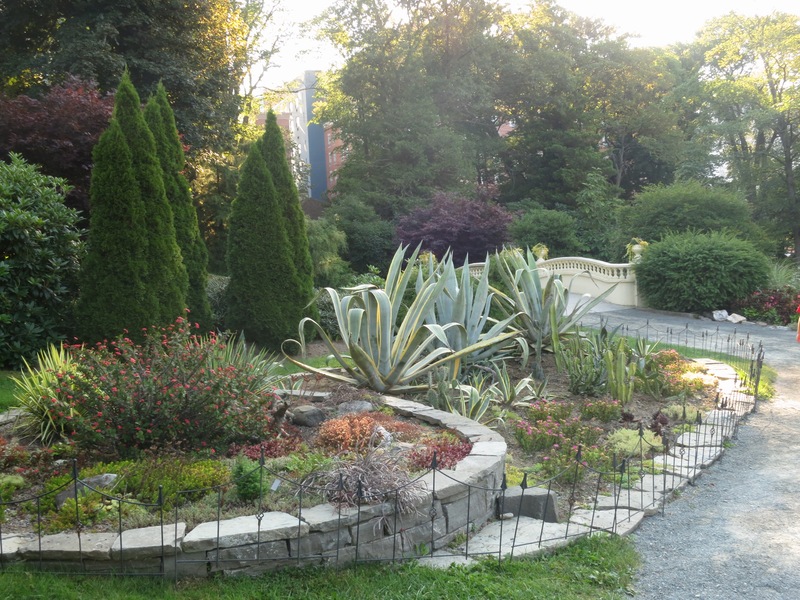 They (the Gardens, not the gardeners) are starting to clothe themselves in their fall finery, in the form of fruit and berries and late summer flowers. Though you see the occasional changing leaf colour, that spectacular show is still to come. One part of the Gardens which doesn’t need a helping watering can hand. A sure sign of fall, Sorbus aucuparia (Mountain Ash tree) berries and Canna lily flowers (because it takes so long for them to bloom). 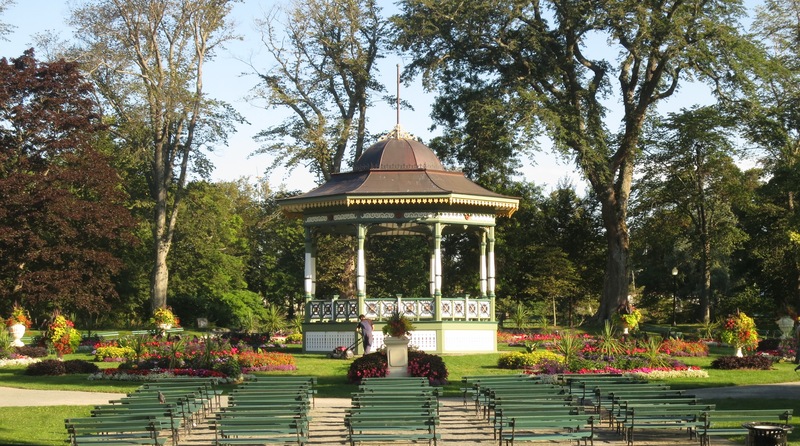 You would be forgiven for thinking the season isn’t so far along after all when you admire the very floriferous geometric beds around the bandstand. 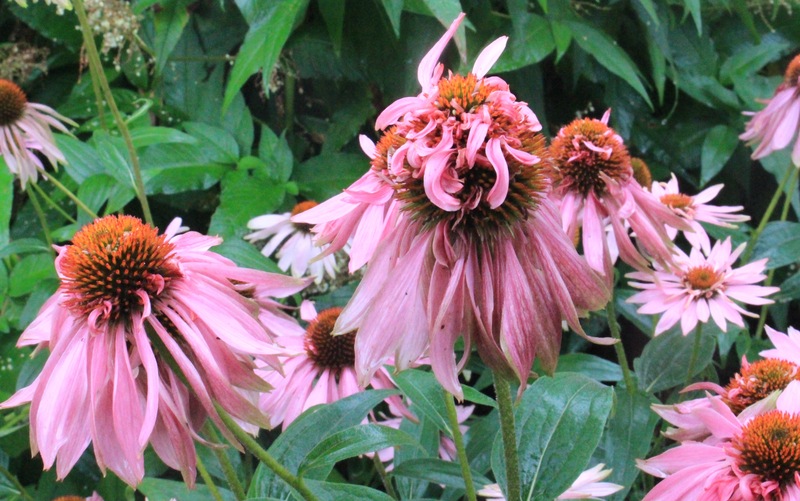 Echinacea having a bad (or good) hair day. A sure sign of the late season. A perennial delight at the Gardens. 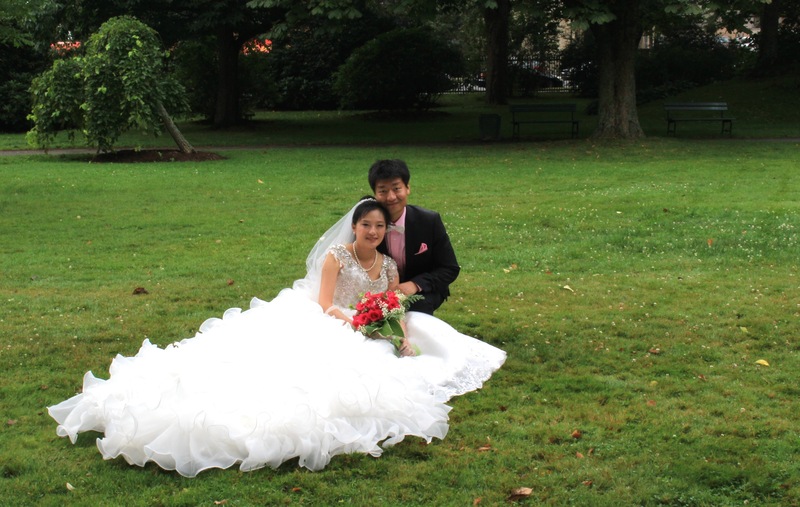 Not only do the plant materials hold out the promise of a bright future, but so do the happy couples who come to the Gardens to record the beginning of their union. I find it impossible not to be charmed. 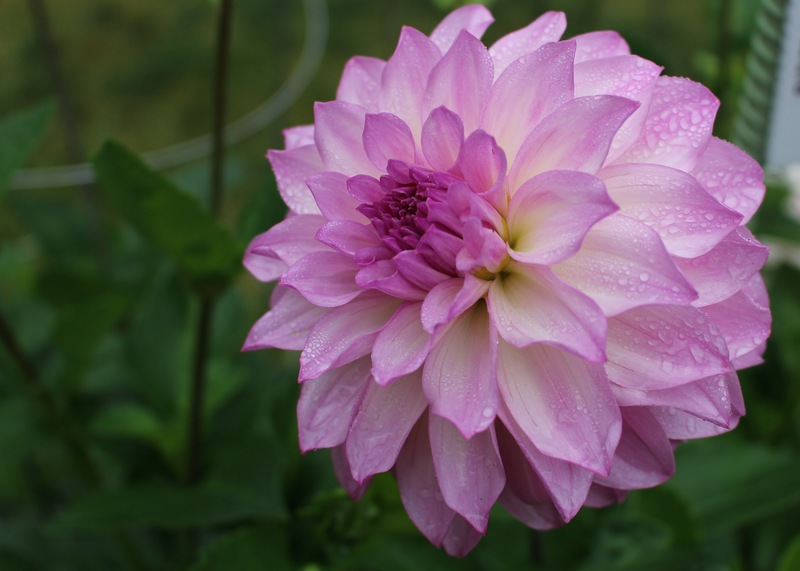 What can you say about the beautiful and varied Dahlia blooms. I’m not articulate enough to do them justice. I’ll let them speak for themselves. 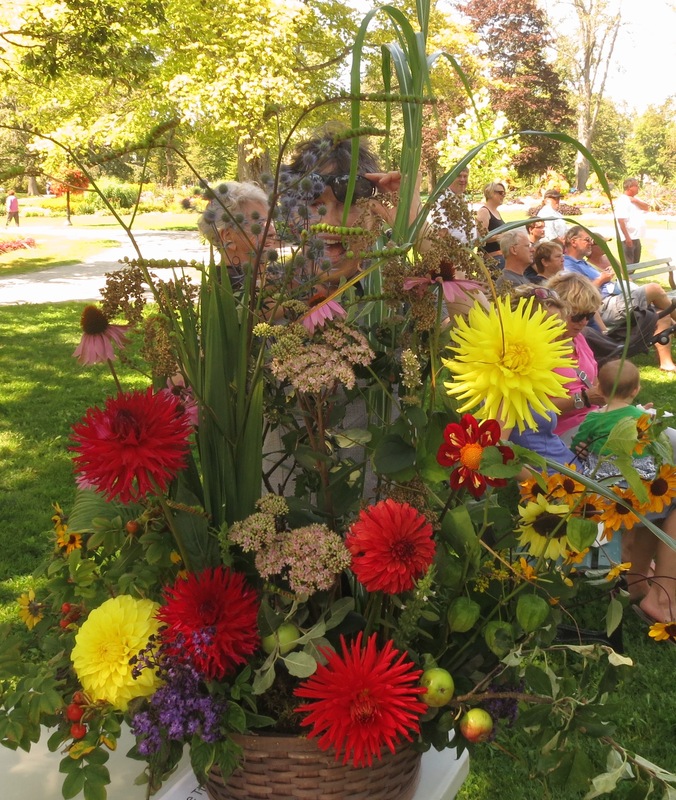 A great crowd showed up for Dahlia Day. It was a sparkling day and the guests of honour (the Dahlias) were suitably impressive. 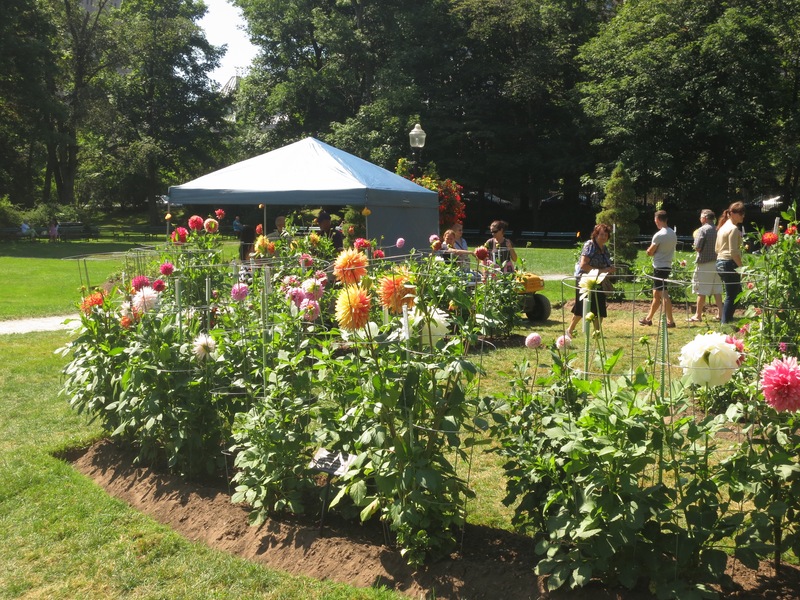 The Nova Scotia Dahlia society had a tent set up by the larger of the Dahlia beds, and were on hand to give expert advise on all things Dahlia. 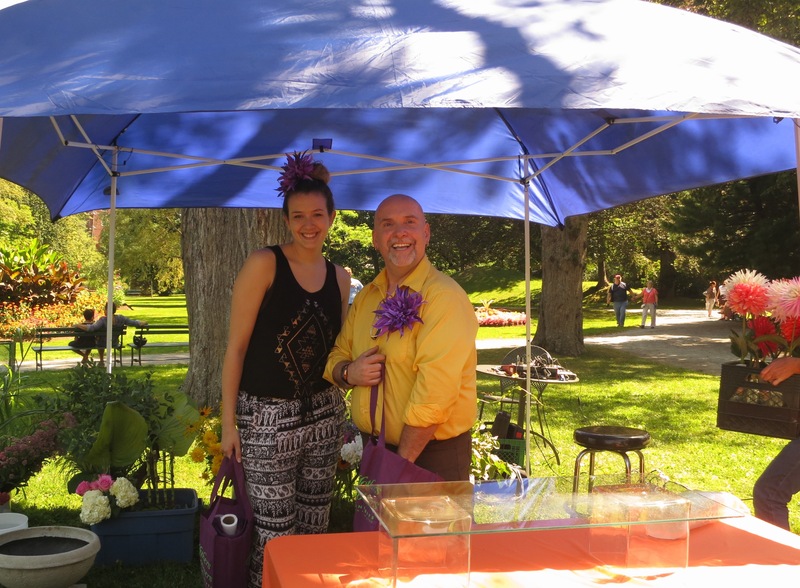 Some of their members also grew and donated the fabulous blooms used in the floral demonstration. Neville MacKay, who travels the world doing floral demonstrations, put together around a dozen arrangements which were later raffled off . Not only does he create amazing and varied arrangements but he also brings much hilarity and knowledge to his audience. The big smile behind this lovely arrangement belongs to a very generous volunteer for The Friends, who happens to have won the arrangement she so badly wanted. What goes around comes around. A quieter corner of the Gardens. 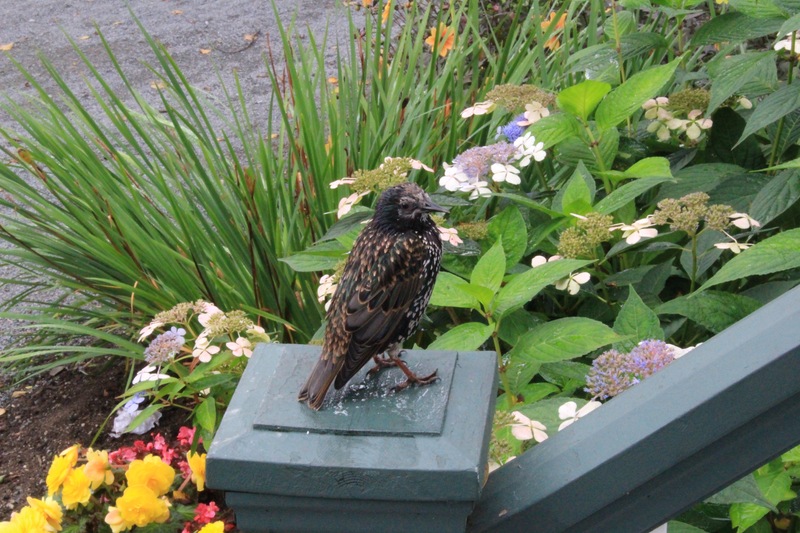 I was welcome to take his picture, so long as I offered up a crumb afterwards. They’re worse than my old dog at the dinner table. 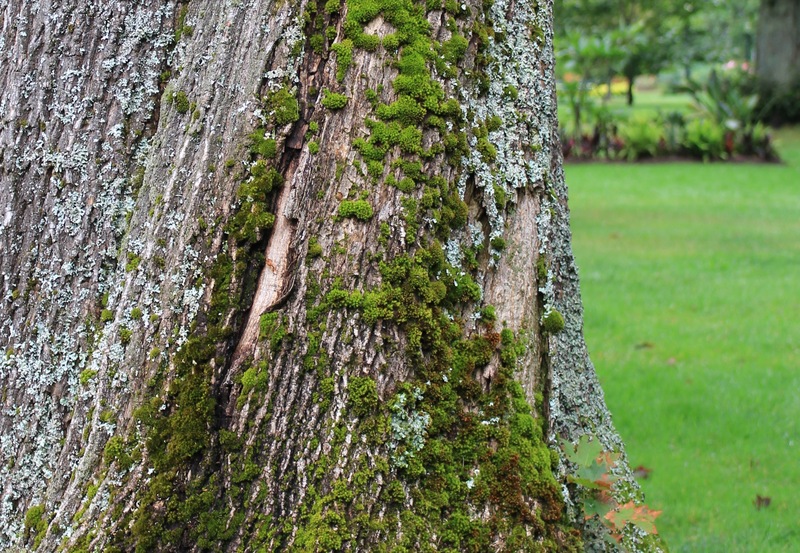 Contrary to popular belief, moss and lichen growing on tree trunks do not cause it any damage. They are not parasitic, but merely use the tree as a support. It makes it easier for us to admire their miniature cultures. 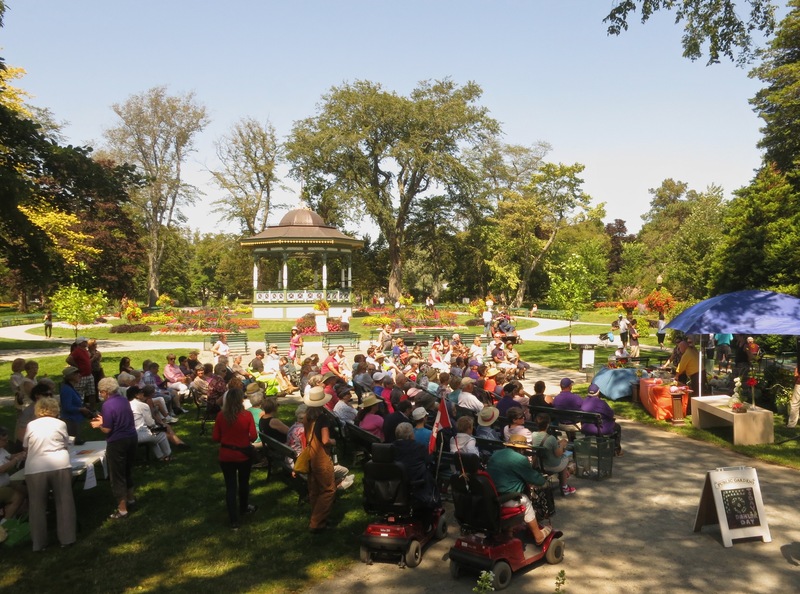 The last performance in the Summer Concert Series takes place this Sunday, September 14 at 2PM. The season may be winding down but the Gardens will continue to be a busy place… the cruise ships season is in full swing. Welcome all visitors! I’ve never experienced the maritime side of Mallorca as the water is too cold when I’m there in winter, so I decided to Carpe diem and stretch my summer out a little longer. I’ll post one final time from the Gardens before I go then if you care to join me we can go beyond the gardens path and explore other gardens. In the meantime… get them while they’re hot, the show is not yet over. If you’d like to view the collection of Dahlias and can’t make it down yourself, I have posted them in the photo gallery of our website. All copy and images copyright © Serena Graham-Dwyer, 2014. If you wish to use any part or whole of an image, in any manner, please contact us. 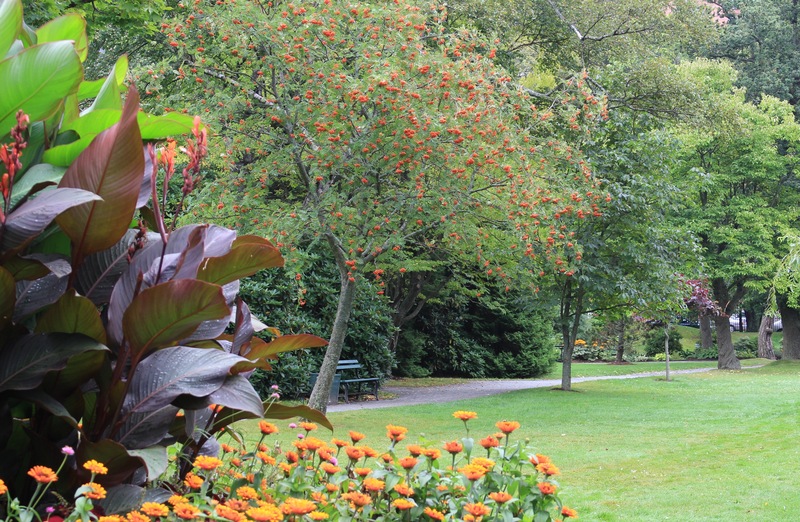 This entry was posted in Fall, Halifax Public Gardens, photo tour, Special Event and tagged dahlia, Dahlia Day, Griffin's pond, Halifax public gardens, sorbus aucuparia by friendsblog5665. Bookmark the permalink. Thanks for the pics. Here in Toronto we had a relatively wet and mild summer and only had to water gardens and newly planted trees sporadically . Thank you Serena for this wonderful contribution. Every time you send something it is the joy of my day and greatest blessing to open it and admire. I would love to receive your postings from your winter hide away. Thank you Carol. Your comments make the effort worth it. I will try and find some spectacular gardens to share.